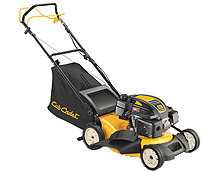 The Cub Cadet CC 46 ES Self Propelled Lawn Mower is a front wheel drive lawn mower with a variable speed control that lets you adjust the speed of the lawn mower to your own personal pace or to the conditions that you are dealing with. With the 21 inch steel deck, you can make quick work of most urban lawns and chose between one of three cutting options. Collect the grass clippings in the rear bag 2.3 bushel bagger, mulch the grass clippings or spread them on the lawn with the side discharge. Note that if you let your lawn get too long, mulching does not work as well as you might expect. If this happens, cut and bag your grass clippings and then run over the lawn again with the mulching option. Cut your lawn often so that it does not get too long for mulching. Operators can also adjust the height from 1 inch to 3.75 inches so that you can cut your lawn to the desired height. These features combined with others will talk about later in this post make this a great lawn mower. Front wheel drive lawn mowers are easy to maneuver. All you need to do to change direction is lean on the handles a bit to bring the front wheels up to disengage them from the ground and turn in the direction you want to go. Once you drop the front wheels, the front wheels grab the ground and away you go. You can also adjust the height of the cut with a single leave to one of nine positions to cut your grass to the exact height you need. This really comes in handy if your grass ends up being a little longer because your forgot to cut it, or you want the grass to grow longer during dryer seasons to protect the roots. 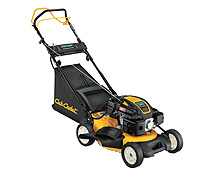 This Cub Cadet 46ES Lawn Mower also comes with an electric start to make it easy for just about anyone to start the engine and cut the grass. Of course there are the usual safety bars to stop the engine if you let go of the handle. Never try to adjust the lawn mower in any way without first stopping the engine to avoid any chance of injury. For more Cub Cadet posts, click here. The Cub Cadet 999ES is self propelled push lawn mower, rear bagging system with electric start for convenience and ease of use. This lawn mower comes with a powerful Briggs & Stratton Engine that starts at the push of a button. There is a 21 inch cut with a 3 in one system for bagging, mulching and side discharge. 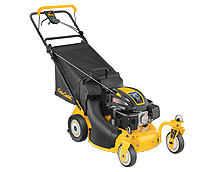 This Cub Cadet 999ES has all of the features to make your lawn cutting chores easy and enjoyable. Let the lawn mower do the work while you walk behind and get you walking exercise. 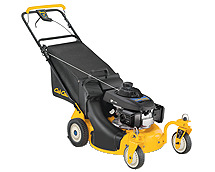 The Cub Cadet 999ES rear bagger comes with a 2.5 bushel bag large enough to catch a lot of grass clippings but not large enough that it is too heavy to carry when full. The seven inch caster wheels make it a breeze to turn corners and maneuver around those tight spots. The rear wheels on the Cub Cadet 999ES are nine inch wheels with industrial tread. If you need to adjust the height of the lawn mower the Cub Cadet 999ES allows height adjustment with a single control to adjust all wheels from the front. The drive system drives from the rear with a six speed transmission. 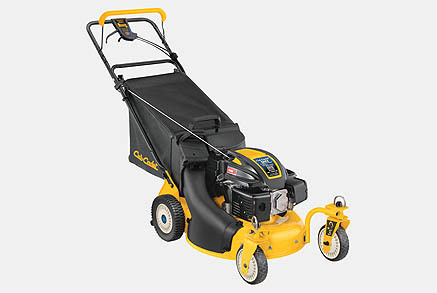 The price was not listed on the web site and there was no option to purchase the Cub Cadet 999ES online. Consumers interested in this product and look up an authorized dealer that is located near them. Regarding delivery, the best plan is for consumers to pick up their Cub Cadet 999ES at purchase time. However if there is insufficient room in your car or van or if you do not have access to a trailer, customers can arrange for delivery at a reasonable cost. It is much cheaper to pick up the Cub Cadet 999ES at the dealer yourself rather than have some one deliver it. Read the manual thoroughly before operating the Cub Cadet 999ES for the first time. Become familiar with the operation of the Cub Cadet 999ES, the drive system and the speed in the various forward gears. Check that there is sufficient fuel in the fuel tank and oil in the engine prior to starting for the first time and every subsequent time you use the Cub Cadet 999ES. This is a good practice to get into in order to avoid damaging the engine due to low oil levels. While operating the Cub Cadet 999ES there are precautions that everyone should take while operating a lawn mower. For example, when using the side discharge never stand in front of the discharge and never allow anyone else to stand there . At times, sharp objects can be picked up by the lawn mower and expelled at a high rate of speed. You do not want to be hit by one of these. In addition never operate the Cub Cadet 999ES with the side discharge pointing towards buildings or cars for the same reasons. You do not want stone chip marks on the side of your car! 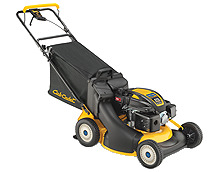 The Cub Cadet 999ES is a powered lawn mower with 6 forward speeds. Operation of the mower should be at a comfortable speed for the person walking behind and at a speed that allows the lawn mower to cut the grass cleanly. Moving too fast may be uncomfortable for the operator and your lawn may not have that finished look after cutting is completed. Always turn the Cub Cadet 999ES off before doing any kind of maintenance on the lawn mower. This includes removing the rear bag full of grass clippings. The few seconds you save is just not worth the risk of some kind of accident. Maintenance of the Cub Cadet 999ES is much like all lawn mowers. When you are fished cutting the lawn, always empty the rear bag and clean off the lawn mower of all debris. Cut grass left in the bag will begin to rot and will cause the bag to deteriorate. Cleaning off the deck also eliminates corrosion over the life of the lawn mower. 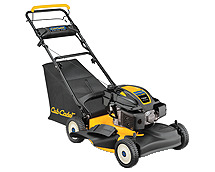 Follow the instructions in the manual regarding oil changes for the Cub Cadet 999ES lawn mower. If there is heavy use of the lawn mower you may want to change the oil several times during the season. Otherwise change the oil at least on an annual basis to avoid damage to the engine. From time to time you will need to have the Cub Cadet 999ES lawn mower blade sharpened. Consumers can do this easily , however there are some precautions you should take. First disconnect the battery leads and disconnect the spark plug wire. This will avoid any chance of the engine starting while you are working on it. Follow the instructions in the manual to remove the blade and sharpen it. If you are uncomfortable with doing this type of maintenance yourself, take your lawn mower into a small engine mechanic for maintenance.